Home » Media » Bob Fitzgerald Single Dad To Family After Tragic Wife Death, Marrying Again? One of the most recognizable sports personalities in the Bay Area, American sports broadcaster, Bob Fitzgerald is a well-known figure in the broadcasting business. He is currently in his 20th season as a play-by-play announcer for the Warriors in the Bay Area. 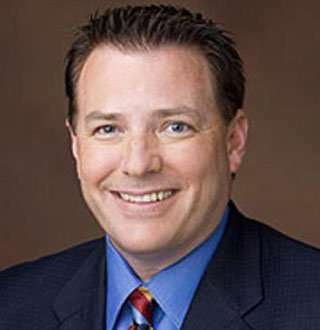 He has received six Emmy nominations for “Best on-Camera” and was awarded “Best on-Camera, Play-by-play Sports” for North California in 2007 and 2014. Read More: Who Is Nancy Cordes Married To? Husband Unveiled Of The Gorgeous Journalist! Fitzgerald initially became popular on KNBR as the host of 10:00 p.m - 12:00 p.m sports talk show “Up all Night.” Later he joined the Warriors organization in 1993 as a back-up play-by-play broadcaster on the Warriors radio network. He also wrote columns for the Oakland Tribune and ANG newspaper for seven long years. Born in 1966, Bob is currently of age 53. He stands at a decent height of 6 feet 5 inches. He resides in Peninsula with his three children, son Eric, Ryan, and daughter Quinn. As for his education, Bob is a graduate of the University of Notre Dame. During his time at Notre Dame, he worked as play-by-play broadcaster Fighting Irish Football and Basketball on-campus radio station WVFI. He also received his Masters’ Degree in Sports Management from the Ohio State University. Nothing is painful and heartbreaking than having to experience the loss of a loved one. Especially if the loved one is the love of your life. Well, for Bob he had to encounter such a situation when his wife Carol, passed away after a lengthy battle with pancreatic cancer on 20th September 2016. Just after a month of their 28th anniversary in 4th August 2018, Carol left her husband and their children all alone. You Might Also Like: Diane Sawyer Personal Life: Husband’s Tragic Death To Children Details! It's been more than two years that Bob has been taking care of his three kids (Eric, Ryan, and Quinn) as a single father. Seems like Bob hasn't had any idea of marrying again fulfilling responsibilities of both father and a mother. Fitzgerald has made a name for himself as one of the top broadcasters of his time. He gained notoriety initially through his time in KNBR as the host of the 10:00 p.m - 12:00 p.m sports talk show “Up All Night.” As of now, he is the co-host of the popular show “ Fitz and Brooks” from 1:00 p.m- 3:00 p.m on KNBR 680. His 20 plus years of broadcasting at the highest level has certainly earned him a handsome amount. His exact revenue, however, seems to be under the rocks. Information about his net worth also is unavailable as of now. But taking into consideration his reputation, skill, and experience, we feel he might be worth a decent amount.